In the Meantime...: be gracious with yourself: lists, rock climbing, & being 25.
be gracious with yourself: lists, rock climbing, & being 25. Well friends, here I am. My 24th year has come and gone. Tomorrow is pretty much the official ending to my summer as students return for training week. Another summer here and gone. It made me think about time and our expectations. So for those of you who have looked at this thing a time or two, maybe you saw my summer adventure list. Today I'm realizing, as reflect on this list I made for myself, how very ambitious I naturally am. So much so, in fact, that I'm still not convinced I can't finish a few more of these things within the next few weeks. Ambitious, I tell you! I'm just over half for my list. The Stonearch bridge was walked, I started the harmonica, did some water activities, hit up the farmer's market and outdoor concert fun, took a road trip, got red in my hair, tried a new food at Seasalt (that's a 2 for 1). A few I didn't exactly accomplish, but close variations that I may choose to claim. A few I still hold out hope for. 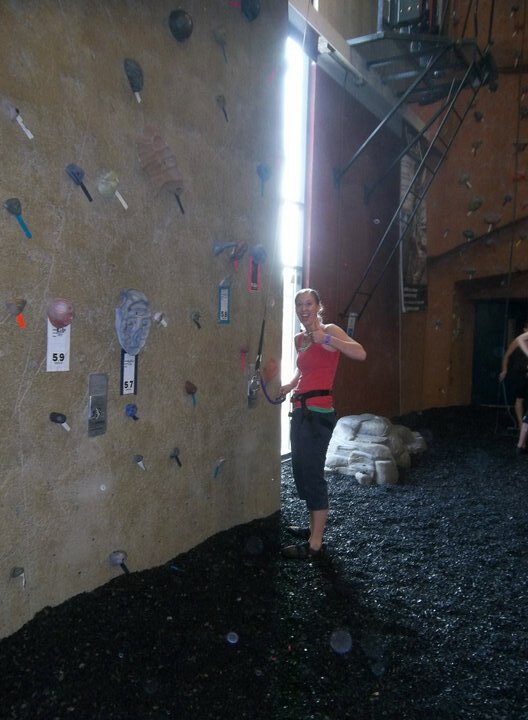 One thing that wasn't on my list was rock climbing. A few friends and I went rock climbing last week. We had fun. I thought myself to be fairly experienced with climbing walls after a summer of it at my camp. After 2 consecutive days of hard workouts previously to climbing, my body was very sore. I was a little worried about that, but still pretty confident because I wasn't new to this activity. Boy, did I stink. I was not good. I only made it to the top maybe 3 times. I couldn't grip the holds. My muscles were shaking and I gave up after awhile. My friend who was new to climbing had little trouble scaling the walls. Usually I'd spend a day or two moping about this or being bitter toward my friend for doing better than me. Especially when it comes to physical challenges, I want to excel! This failure was awesome. I fought the bad feelings, stopped making excuses, accepted my limitations, and embraced the day as fun. I didn't meet my expectations, but I tried, I learned, and had a good time with friends. So I'm a person of reflection. Maybe that's because a professor I had in college couldn't get enough of it, but I appreciate the opportunity to take life beyond just experiencing, but actually gleaning something. So I spent some time reflecting on my summer. And year 24 of my life. There were beautiful times and difficult times found in each--some experiences being both beautiful and difficult simultaneously. Each had its own set of expectations. --I always want to make a year the best year ever. I want to make an age worthwhile. I feel pretty good about doing that with 24. I've challenged myself personally and relationally. I've taken huge strides in walking in community and exploring what it means to surrender independence. I've worked through wounds (and still continue to do so). I've experienced the joy and hardship of my first year of professional ministry. I've taken journeys. :-) Co-leading my first abroad trip and getting to experience the Holy Land, something that 24 will always be remembered by. --This summer, I've processed through many difficult good-byes, learned how to rest on my own, began to learn how to embrace community with generosity and love, and learned that some of the best adventures or experience are ones you didn't plan on or even know you wanted. Those rock. Even so, with all of that, I felt a tug yesterday. As birthday wishes rolled in, I heard lots of jokes about being closer to 30 and being asked what it feels like to be on the brink of a quarter-life crisis. I take it all pretty lightly, but for a moment I wondered, "I'm 25. What do I have to show for it?" I laughed to myself. Well...not really much of any possessions, which I'm pretty okay with,...not a diversified portfolio or kids or a boyfriend or a cool car or a master's degree or an album or even a pet. I've been trying to climb this wall called life for 25 years and sometimes it feels like I haven't grabbed too many big holds. It's easy to get discouraged by expectation. Most of the time, I would argue, that they're not even our own expectations, but an expectation of comparison--an oh-so-dangerous measuring stick to live by. Obviously, there's lots that an ambitious girl didn't get done with her summer. It's a fact. I've embraced my ambition. I understand that some things have to be let go. Lists and goals are beautiful things. It keeps us intentional and focused. We need some prize to keep our eye on. However, I constantly must remind myself that the points on my goals and lists aren't always on God's list of goals and plans for my life. Our agendas don't always line up. I think I'm going to end up in Minnesota with another snowy spring break and He gives me the gift of a 10 days in Israel. The path that we plan to take is not always the one God leads us down or if it is, it's usually not what we think it'll be. We don't know the plans. When we get so set on our own plans for our story and find out that they don't come to pass, it can be easy to get discouraged and disappointed. The purpose for lists is to keep us going, not stop us with guilt and regret. I refuse to be disappointed with the amount of checks on my summer adventure list (even though it'd be fun to get a couple more). I refuse to be upset or bitter about things I haven't yet accomplished in my life. God gave us freedom and grace. It's not just for us to give away to others, but also to receive ourselves. Be gracious in your reflection. Embrace your journey. Realize that wherever you are in that journey that God has filled your life with stories. They may not have been the stories I would've chosen, but it'd be lame if they all were. Every once in awhile you watch a movie knowing how it ends, but generally it's not desired to know the outcome. Life leaves an element of surprise that teaches us to trust and lean on one another. I want adventure and that's unpredictable. Even with boxes unchecked, there is always one thing on my list I can accomplish. That's to bring joy. To choose joy in the waiting. In the adventure. In the mishaps of adventure. In the boring. In the devastating. In the seemingly hopeless and the utterly disappointing. Choosing joy. Bringing joy to others. No matter the things to come or what has been, God is faithful. God is providing. God is unfolding. He is untouchable and unchanged. As long as the tomb is still empty, we have reason to be overflowing with joy. If you are disappointed about failing to accomplish any goal, may it be that one. So here's to 25--a year of joy and adventures both planned and unexpected, and to the grace I will rest in for the things that don't get accomplished. Here's to lessons, stories, relationships, and choosing joy.